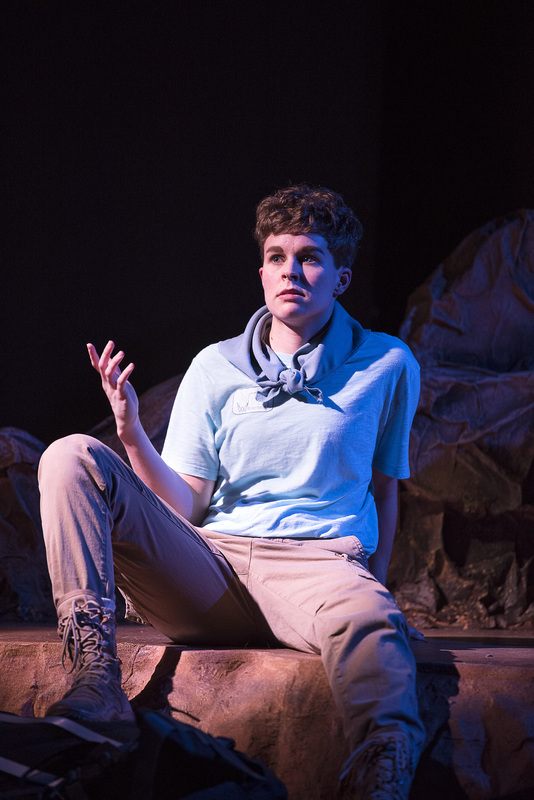 The Canadian premiere of this play, based on true stories of troubled teenagers sent to a wilderness camp against their will, was a captivating look at the way nature can heal us and provide comfort even when we’re sleeping on the ground in the desert. The healing properties of nature are well-known, but for these six troubled teens, it seems that the isolation and camaraderie of their collective experience is what helped them to work through their individual trauma or anxiety that drove their parents to send them to the desert. With Jennifer Stewart’s rugged, rocky set as the backdrop we get to know these teens and learn about their quirks, such as Dylan’s participation in the bell choir (Heather Barr). Barr’s performance was nuanced, deeply emotional, and immediately made us care for her character. Meanwhile, the camp counsellors have their own problems as they try to help the campers work through their issues and open up about their pasts. One of the most impressive aspects of this production was the choreographed sections by Raes Calvert woven into the narrative. Rather than being misplaced or distracting, these added a subtle layer of meaning to the experiences of these teens and their relationships to their parents. For example, the midnight kidnapping that took them to the Utah desert camp was reenacted in a brilliant physical theatre sequence that was a highlight of the show. The music, with direction by Mishelle Cuttler, was another highlight of the show with songs about the outdoors such as “A Horse with No Name” that set the tone. We also hear from the parents who have sent their teen to wilderness therapy, and their perspectives add a rich layer to the story. The parents and teens struggle to find common ground and often don’t understand each other, but all of their stories demonstrate their love for each other and their commitment to improving their relationships. Mental health, addiction, and gender identity are just a few of the tough subjects covered in this deeply emotional tale. Their stories are raw and authentic and leave us with a sense of hope and confidence in the power of human connection.